The City of Light. Do you know why Paris was given this title? It was because Paris was the city of a thousand lights, of a thousand reflections and the play of shadows which make her fascinating and mysterious at the same time. 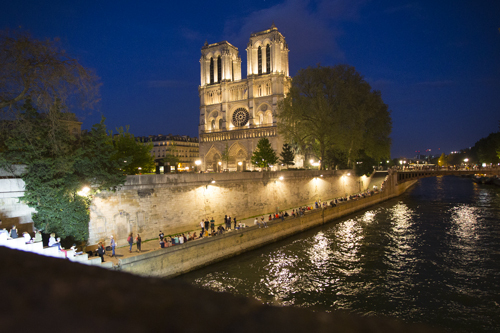 Paris is undoubtedly a beautiful city - but at night, the city is perhaps even more beautiful. When the sun goes down, she changes her outfit, puts on her make-up and prepares to enchant, something which, since the era of the Belle Époque, has bewitched philosophers and artists as well as the occasional passer-by. The Eiffel Tower is lit up and appears to be flying above the capital creating picturesque plays of light across the Seine and the famous Bateaux Mouches which are constantly travelling up and down the great river making the lovers who are sailing on them sigh with pleasure at this beautiful sight. From the water, you can still sense the city's unique atmosphere which emanates from wherever you are; Place de la Concorde, the Louvre, Notre-Dame. The French capital is always alight, even on Mondays. There is no start or end to the weekend in Paris. All the neighbourhoods and different districts are buzzing with tourists, the locals are singing and celebrating, as do some of the tourists and the vast squares embrace all those who pass through them. Someone once said that the night doesn't exist in Paris. Travelling along the Rue de Lappe and Rue Oberkampf is like finding yourself inside a painting by Matisse, full of colour, shops, bars and pubs in which a plethora of young people are singing and playing music until dawn. In the evenings, people can enjoy dishes of the celebrated French nouvelle cuisine whilst sipping a glass of perfumed Burgundy, go to the theatre, visit a museum and generally just enjoy life. You can share in all of this without having to awaken from the spell that Paris casts over anyone who is discovering her charms at nightfall. Taxileader.net is able to provide a fantastic service. "A Car Tour of Paris by night." This is a virtually unique service that will enable you to experience the Ville Lumiere by night whilst sitting comfortably in your private car with a driver. And everywhere you go can be chosen by you! The night tour of the capital lasts for four hours and can be booked for any day of the year with the sole exceptions of Christmas and New Year. You will be able to choose what time to start the tour, from 18:00 onwards, and where you would like to meet your driver. It is the ideal solution for anyone who wants to visit Paris by night, particularly in summer because the Touríst Bus stops running at 20:00 hours when the city is still very much alight. Opting to book a Tour of Paris by Night means choosing the comfort and convenience of a private and personalised service with professional and punctual drivers. Let yourself be guided on a marvellous tour of discovery in the City of Light by drivers who know the city from top to bottom. We would remind you that if at the end of your tour, you wish to return to wherever you are staying, you will just need to ask the driver during your tour. How may attractions do you want to see? How many sights can be visited on a night tour? The total number of attractions will depend on what the client requests. For example, if the client wishes to stay at the Eiffel Tour waiting for the lights to change, the driver will simply await the client's return in the car so that afterwards, the journey can continue to the next venue. You choose your own pace: you choose the itinerary and the number and duration of stops! The beauty of moving around the French capital with your own private transport means you don't waste any time getting from one place to another. The Tour Paris by Night Service enables every client to organise a wonderful nocturnal trip around Paris, to choose the car and the driver you want and, if you book well in advance, you can also specify that you do require an English speaking driver. Complete freedom means the freedom to choose when to start your tour, where you want to be collected from (excluding from the airport), the itinerary you want and how long each of the stops should last. Why should you choose a nocturnal city tour by car? In general, deciding to rely on a transfer service around the city, such as the Tourist Bus for example, means sharing it with strangers and adapting your plans to someone else's schedule. In addition to this, in summer, the last trip that the Tourist Bus makes is at 20:00 when it is more or less still daylight and therefore, too early to enjoy the panorama of the city when it is lit up at night. On the other hand, deciding to use the Metro can sometimes involve rather unpleasant surprises if you come across someone with bad intentions and being below ground means that you don't get to see anything of the city anyway. Travelling around the most beautiful streets in Paris without having to worry about anything like that is priceless! The only thing you need to think about? Putting together a tour with the map you have in mind, choosing where to stop and then enjoying your night out. How to organise it? Very simply! You can set this up by selecting the booking form on this page entitled "Tour Paris by Night" and book your trip around the French capital. You can choose the type of car you want, the driver (specifying an English speaker if that 's what you need) and agreeing on the sort of visit you want to make to all the best loved places in the city. A city tour by night will take your breath away thanks to the exclusive service that is on offer and the convenience of not having to rely on public transport which generally isn't a beautiful experience at all.